How is cycling in the rain different from cycling in sunny and dry conditions? With all that, why would you want to go cycling in the rain?! Rain stories can make for some good stories! Best of all… all in the experience! Okay, so you’ve decided to go out riding the next time it rains. You do have to change your technique a bit when the roads get wet. Reduce your risk of anything going wrong by keeping a few things in mind and taking some precautions. 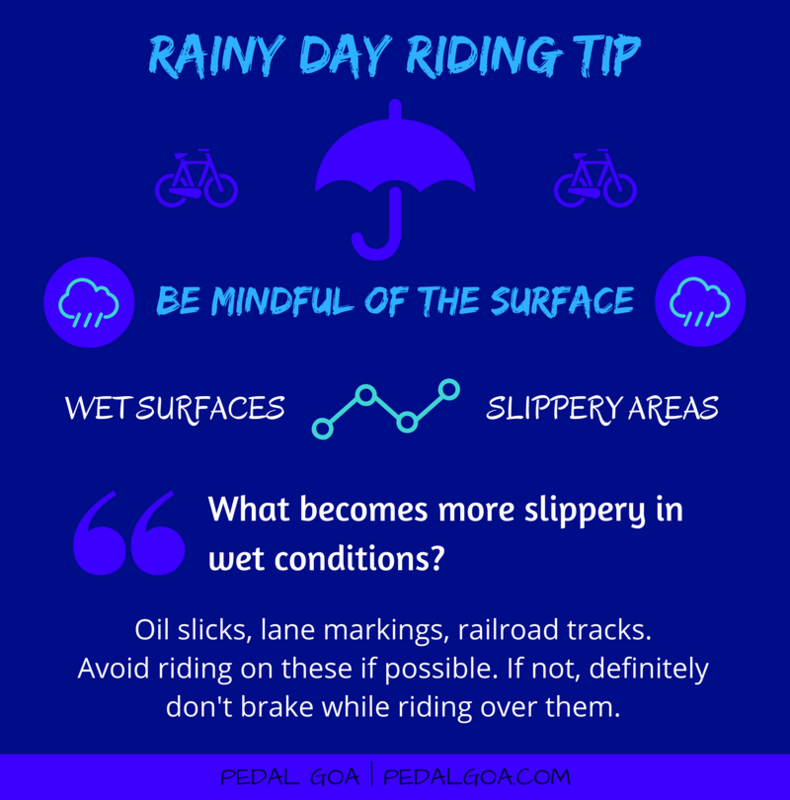 Here are some tips for cycling in the rain. Wet road conditions mean traction between your tires and the road is at a premium. The wet roads provide less grip between your tires and the road surface, so you’ll want to increase this for better grip during the slick conditions to support your tires. You can do this by decreasing your tire pressure. 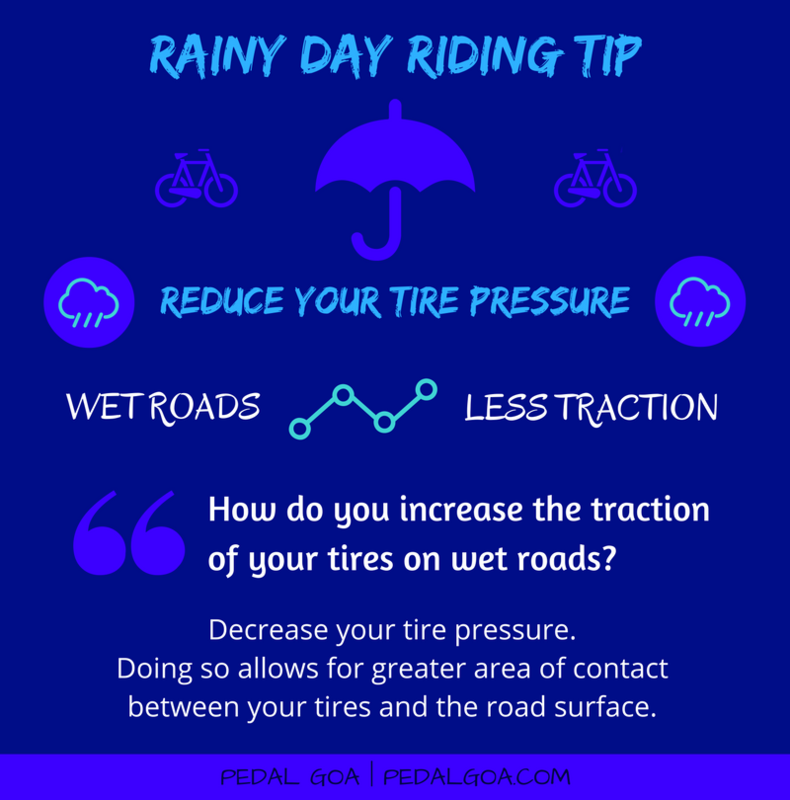 Doing so allows for a slight increase in contact between your tire and the road, thereby increasing the traction and giving you much need grip during the wet conditions of the road. 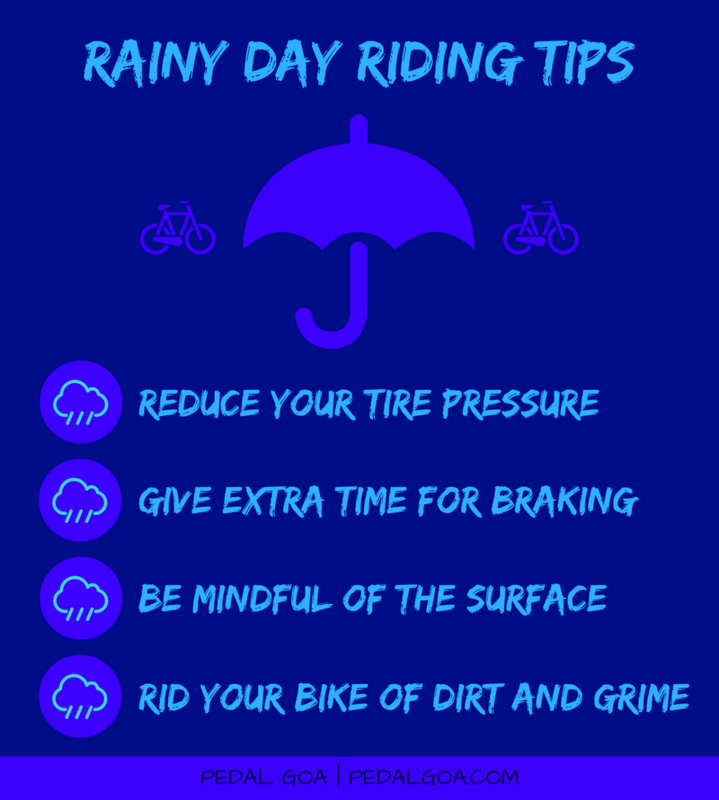 As general guidance, take out 10 psi from your tires when going out for a ride in the rain. 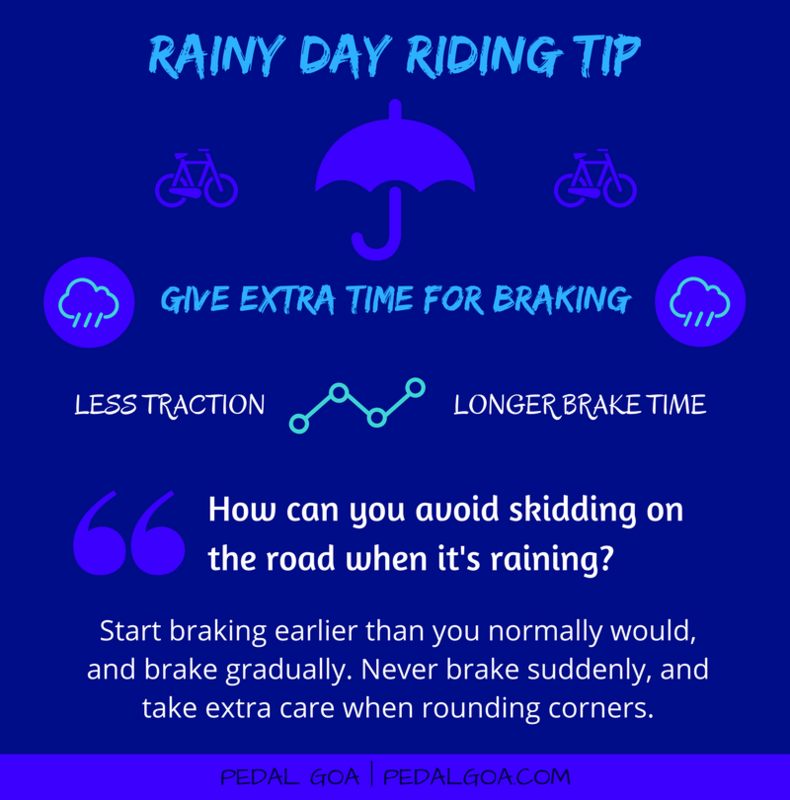 Your bike’s brakes are much less effective when they are wet. It’s going to take you longer to slow down because the wet roads means your tires have less of a grip on the road. To counter this, you’ll want to allow more time to slow down and brake than you would in dry conditions. You also want to take care not to brake hard or suddenly, as this also increases your chances of losing control of your bike for some skidding action. Start the braking process earlier than you normally would and start to decrease your speed smoothly and gradually. You want to be especially cautious when rounding corners and making turns, as this is a time when your tires are even more vulnerable to slipping. Again, start the process of slowing down earlier than you typically would. Avoid riding over these if you can, and if you can’t, ride over them with your handlebars completely straight to avoid slipping. Especially try to avoid braking when riding over these sorts of patches. All that road grit that splashed onto your bike from cycling in the rain is no good for the longevity of your bike. You take good care of your bike, so you are already cleaning your bike regularly, right?! 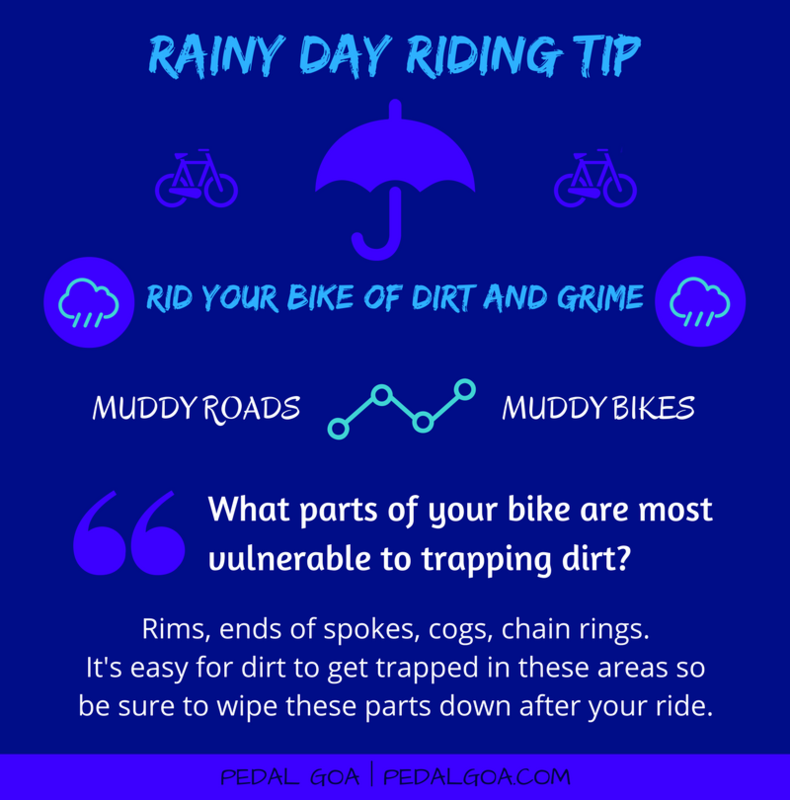 🙂 It’s even more important to give your bike a good basic cleaning following a rainy ride because of all the dirt and grit that can get stuck in all the different small spaces of your bike. To preserve the longevity of your bike and get it lasting longer, take some time to wipe down key areas of your bike. Here are areas of focus for a wet weather clean-up as seen in this video which you can get a visual demonstration in the video below. After the wipe down, it wouldn’t be a bad time to lube your bike as well!